A series of late arrivals combined with a shortage of staff at Customs and Border Patrol caused a backup for Bay Area travelers at Mineta San Jose International Airport Friday night. Ian Cull reports. 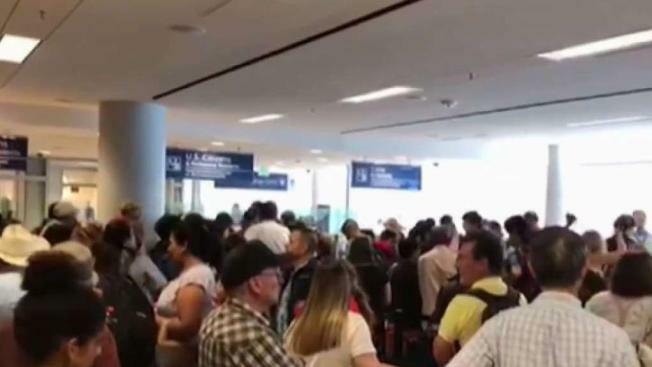 A series of planes arriving at the same time, combined with a shortage of staff at Customs and Border Patrol caused a backup for Bay Area travelers at Norman Y. Mineta San Jose International Airport Friday night. Travelers waited two to four hours in the customs and border patrol checkpoints for flights arriving at SJC causing passengers to get angry. "They should hire more people and be prepared for this," said Lisat Hernandez from Richmond. Several passengers missed their domestic connections by two hours all because of the backup. "Two and a half hour flight to stand in line for three hours," said Steve Heredia from San Jose. What happened Friday is a “perfect storm,” SJC spokesperson Lauren Young said. "They have had some limited staffing at SJC and some of the other Bay Area airports," Young said. "We're doing the best we can to help make sure they have the resources from the airport." NBC Bay Area reached out to Customs and Border Patrol about the staff shortage but they did not get back. "Craziness, it was inexcusable," said Don Bullard.